Awards system - view the awards page here! Quite amazing work done recently, very impressed! 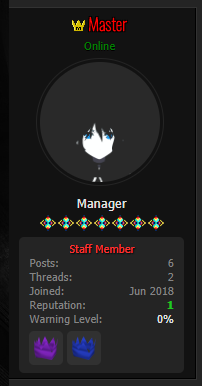 It's nice to see the modernization of the forums. I've now added a simple tabbed menu. (06-16-2018, 07:40 PM)Gemu Wrote: Quite amazing work done recently, very impressed! It's nice to see the modernization of the forums. @ Gemu quotes also work now. and updated the OP with new awards update. What are you gunna use the rewards for? Like forum achievements, in game achievements, a mix of both? Or what? (06-20-2018, 10:18 PM)Beth Wrote: OOOOO: !!!! I'm definitely for that idea too. Depends on @ Gemu really and what he thinks. They could definitely be integrated. Wow, yes. That's actually very cool. When I first read you tabbed the forums, I was a little worried. After I saw it, I actually thought it works pretty damn good. As far as the idea of having awards be for both forum and in-game achievements - that sounds great to me. I assume that we can upload our own images for the icons? I figure that's what you did with the partyhats. We will have to add the in-game rewards manually, after a player specifically seeks it out though. I guess which means we'd need to (after we've created all the rewards) add an information thread as to what all the rewards are. I think it'd be a great addition to the forums, and to publicize. Maybe players would want their recognition on the forums even if they don't use them much. Like @Beth said, it could cause incentive to post or use the forums a bit more often. Wonderful updates to the forums again, I'm liking it more & more.